The overall aim of the project is to release open metadata for the Fitzwilliam Museum’s Designated Collection (over 150,000 records), enhancing existing OAI-PMH provision (using RDF) as well as making the data available using open data technologies as advocated by the JISC Discovery programme. To release open data, extending provision beyond the OAI-PMH model used in the Contextual Wrappers project (www.context.collectionstrustblogs.org.uk ) to include RDF delivery and a SPARQL query service endpoint. To prototype the modelling, linkage and integration of metadata relating to specialist research information generated by the museum. Prototype the storage and editing of collections level description records, prior to release for aggregation, and the links between these records and item level data. Increase the knowledge and skills within the Museum to enable active participation in the metadata ecosystem that forms part of the JISC Discovery programme objectives. Release of open data for an internationally important museum collection of significant value to HE community. Consisting of over 150,000 item level records, including 500 illuminated manuscript records. Documentation and guidance for reuse of this metadata. This will be an ongoing service that the Fitzwilliam will continue to maintain with the regular addition of new metadata. in line with the Museum’s digitisation programme. Update release of metadata to Culture Grid, available for resource discovery and re-use through the Culture Grid API and data streams. Prototype data models for research outputs related to the collection, focusing on the early-stage outputs of the illuminated manuscript pigment analysis project. Establish Collection Level Description (CLD) store and editing facilities within the Fitz Information Management architecture. Prototype data models and automation for linking Collection Level Records to Object level records within the Fitz Information Management architecture. Middleware layer in theFitzwilliamMuseum’s data management infrastructure that connects collection level descriptions, object record data, research and other data. Internal RESTful SOLR query service endpoint. OAI-PMH configurable connector able to deliver collections (standard: RSLP as per defined in Contextual Wrappers 2 project http://contextualwrappers2.wordpress.com/ ) and object records (standard: PNDS-AP). RDF delivery endpoint for open/linked data with triple-store data storage and data mapping to CIDOC_CRM. Image processing module within middleware layer to enable delivery of images with metadata where appropriate. Project report, fully documenting project learning and offering guidance for other organisations wishing to take a similar approach. Full contribution to JISC Discovery programme events and initiatives. The collections of the Fitzwilliam Museum are Designated of national and international importance and are used widely for research and teaching in the HE sector. The project will release metadata for all the objects that are currently included in the Museum’s online catalogue (over 150,000 records) with a particular focus on illuminated manuscripts. The collections of illuminated manuscripts in the Fitzwilliam are an important resource for teaching and research, particularly in the field of medieval studies and history of art. They are used regularly in the University for teaching undergraduate and MPhil students from History, History of Arts and the Faculty of Modern and Medieval Languages. The manuscript collection is also consulted regularly by scholars throughout the UK and abroad. Metadata about the manuscripts will be released and the project will explore mechanisms for linking this to research material generated around the objects as a model that can be applied to other aspects of the Museum’s collection. The creation of collection level descriptions, and their relationship to item level records, will also be investigated (linking to the work being undertaken in the Contextual Wrappers 2 project) as part of a broader strategy to improve resource discovery. The host institution will benefit from enhanced technical capacity and an improved infrastructure for the delivery of open metadata. However, this (along with the enhanced knowledge and skill gained by staff during the course of the project) will enable more effective release of collection and research data that will be of benefit to the wider community. Overall project risk is considered low – the outputs will extend and be integrated into the existing data management infrastructure at theFitzwilliamMuseumand build on previous work. This infrastructure will scale to take account of an increase in the volume of metadata created and increased demand. Although there is the potential that enhanced resource discovery will lead to more research/learning enquiries to the Museum this should be offset by improved online resources created as part of an ongoing programme at the Fitzwilliam. Risk that project staff will be unable to contribute sufficient time because of other priorities, including Contextual Wrappers 2 project, (low/medium risk) – mitigated by allocating realistic percentages of time for staff across projects and by maximizing benefits of cross-project learning and information sharing. Technical barriers to deploying middleware system (low risk) – mitigated by working with technical partners with appropriate skills and experience. Heavy reliance on technical input from one project partner (medium) – mitigated by use of open source licences and weighting of critical development to early phase of project. Differing organisational cultures and methodologies of project partners (low/medium risk) – mitigated by building on existing working relationships and establishing clear framework for project development. Difficulty engaging stakeholders (medium) – mitigated by cross-project work with Contextual Wrappers 2 (JISC funded). Difficulty agreeing licensing (low) – mitigated by drawing on experience in Contextual Wrappers projects and ongoing development of licensing strategy. The IPR of project outputs will meet JISC grant terms and conditions. Metadata will be released under open licence (CC Zero or ODC-PDDL). Software outputs will be released under open source licence. FitzwilliamMuseum– David Scruton and Shaun Osborne. Data management and technical implementation within the host institution. Knowledge Integration – Rob Tice, Neill Smith, Rich Bruin. Technical development. Collections Trust – Phill Purdy. Consultant on data management and integration of data into culture grid. Ongoing consultation with curatorial and research staff throughout project to help determine CIDOC CRM mapping, modelling of research data, links to object level data and metadata structure. Consultation (online and focus groups) with potential end users, primarily through link with Contextual Wrappers 2 and Cambridge Illuminations projects. Participation in JISC community discussion, events and activities related to the Digital Infrastructure programme and the resource discovery initiative. WP1 Deployment of middleware information integration module. Installation of baseline middleware layer, ensuring access to all resources and linkage to collections information database. Run a basic extract test against both data types to make sure ids line up and that media is accessible. WP2 Modelling of Fitzwilliam data for extract into information integration module, including research data. WP3 Map Fitzwilliam data model to CIDOC CRM. WP4 Implement media handling/media processing module. WP7 Stakeholder engagement, dissemination and evaluation. Project Team. Recognising the short timescale, the project will build on an existing working partnership. The project team will consist of representatives from Fitzwilliam, Collections Trust and Knowledge Integration, meeting at least 3 times during course of the project. Decisions impacting on project as a whole made through agreement between partners, with theFitzwilliamMuseumhaving final decision on software deployment and metadata release. Technical development. Lead: Knowledge Integration Ltd. Iterative software development using Agile methodology. Project management. Lead:FitzwilliamMuseum. Administration of project meetings and communication. Management of timeline and outputs. Production of interim and final reports. Using methodology based on Prince2. 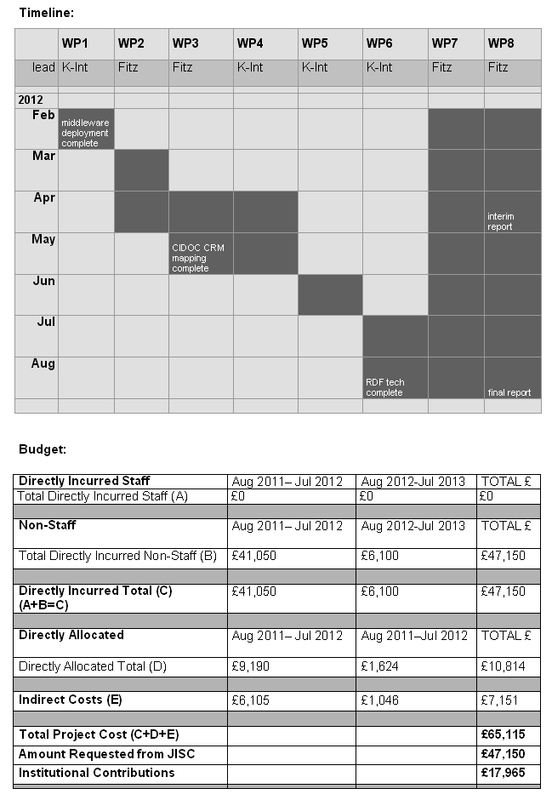 Budget managed using Cambridge University’s finance system.